So because of my science background, when I think pinning– I don’t necessarily imagine the site, Pinterest. I think of entomology class when I was instructed to capture, pin and label insects. But alas, pinning doesn’t have to mean clumsily sticking a pin through the mesothorax. I’m now associating it with a vibrant and visual bookmarking service most often recognized as being populated with women collecting sites about weddings, babies, recipes or baby recipes (just kidding…I do not condone baby eating) . Let’s just say, it’s much easier to “pin” things online than the experience I had in college. Not to mention that nonprofits and businesses alike are finding real reasons to start using Pinterest. So what are you using Pinterest for? 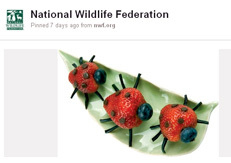 I’m using it for the National Wildlife Federation because I’ve noticed how the interests of people online are becoming more and more visually inclined. You see how well images and pictures do on Facebook, well that translates nicely into Pinterest’s clean interface. Not to mention, in a very short time we saw a large increase in traffic and interaction surrounding our pinly presence. Art and science are so intertwined. Pinterest is a fun place to explore visual collections while increasing sharing and interaction. Not to mention, thanks to our kids publications, we have a number of adorable wildlife crafts and recipes to share. Are you pinning about wildlife, environment, technology or science? I want to follow you! Let me know!